On Sunday 3rd October Husayn Rosowsky from Sheffield Buccaneers Fencing Club won the British Under 20 Foil Championships which took place at the English Institute of Sport. Husayn has been one of Britain’s top international fencers for some years now, achieving a bronze at the World Under 17s in 2007 amongst many other successes. Despite this he has been unlucky with the various British age group championships since winning the British Under 10s a decade ago. Husayn has fenced with Sheffield Buccaneers Fencing Club under the direction of coach Adam Blight since he was 7 and Has two older brothers, Ahmed and Yasin who are also both champion fencers. In a surprising development to their fencing career, Husayn and Ahmed have both been involved in auditions for the next Pirates of the Caribbean film which they have been asked to take part in. Anyone who knows the brothers would say that they would make perfect pirates. Modern fencing is very much a ‘full on’ fighting sport, extremely intense, physically demanding and competitive. 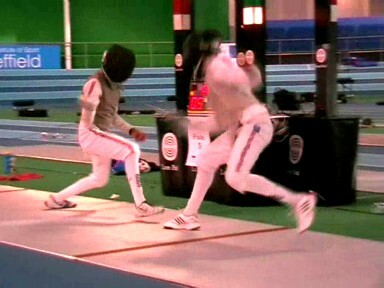 Fencers need lightning fast reactions, great speed, control and tactical awareness. Husayn is one of the fastest fencers in Britain, maybe even the world, but sometimes his temper and concentration have let him down in past events. At the Junior Championships he never let the stresses of the event get to him and maintained his concentration throughout. He knew he could win and was determined that he would not make mistakes on the way to victory. It was not until the semi-final that he experienced a powerful challenge from Alex Tofiledese, winning the bout 15-14. The final against Amol Ratan finished at 15-9 with beautifully controlled and accurate attacks.